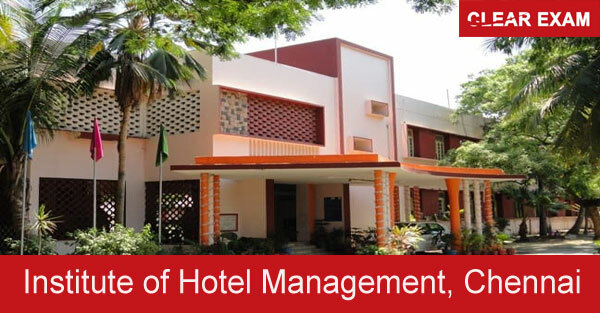 The Institute of Hotel Management, Chennai is one of the IHM that comes under the list of NCHMCT. To get admission in IHM, Chennai candidate have to apply for NCHM JEE exam conducted by NCHMCT, affiliated to Ministry of Tourism, Government of India. With the increasing rate of development of Hospitality industries in India, Hospitality and Hotel Management has become the second largest sector in terms of employment. The best part of Hospitality sector is that they give employment ranging from unskilled workers to professionals. Institute of Hotel Management, Chennai is established with the collaboration between Government of Tamil Nadu and Government of India. The Institute is regulated and maintained by Aaditya Educational Foundation. The Institute aims for imparting best skill, knowledge and attitude to students for providing them best manpower in service and hospitality industry. The candidates are required to score nice marks in NCHM JEE to get admission in IHM, Chennai. The institute has offered best quality courses to the students in Hotel industry and has made its name both at home and abroad with its excellent quality of courses. The Institute also provide Scholarships to students. Candidates are required to give NCHM JEE for applying in IHM, Chennai. The application form for B.Sc. in Hospitality and Hotel Adminitration exam is available both in online and offline mode from December to April. The candidate before applying should go through the eligibility criteria of course. The exam is conducted in the month of April in offline mode. The admit card for the exam is available online. Candidates are allotted seats to a particular college on the basis of rank/marks obtained in NCHM Joint Entrance result and counselling by NCHMCT. Candidates are being guaranteed with best campus placements in all the sectors like Hotels, Airlines and Shipping, Restaurants, Industrial Catering Establishments, Hospitals etc. The students with good academic results are also placed abroad and good position in India. Some of the Placements Hotels are The Oberoi Hotels, The Lalit, and Hyatt and many more. Institute of Hotel Management, Chennai is being granted with National Award for Excellence in Hospitality and Education by National Council for Hotel Management and Catering Technology. Candidates can also get more information about IHM, Chennai through our website Success Mantra.